This model is available as an automated tutorial by selecting Model Examples and Tutorials... > Multiphysics > Flow in Porous Media from the File menu. Or alternatively, follow the step-by-step instructions below. First is to solve a pure laminar flow problem without the porous domains. Select Polygon from the Geometry menu. Enter the following data into the Point coordinates table. Enter 4e-3 into the ymin edit field. Enter 8e-3 into the ymax edit field. Enter 1e-3 into the xmax edit field. Enter 1.5e-3 into the xmin edit field. Enter 3.5e-3 into the xmax edit field. Enter 4e-3 0 into the Space separated string of displacement lengths edit field. Specific grid sizes for subdomains and boundaries can be prescribed directly in the Grid Settings dialog box. Here the grid size in the outer domain is set to three times the porous domains. Enter 1.5e-4*[1 1 1 3] into the Subdomain Grid Size edit field. Select 1, 2, 3, and 4 in the Subdomains list box. Enter 1.2 into the Density edit field. Enter 1.8e-5 into the Viscosity edit field. Select Inlet/velocity from the Navier-Stokes Equations drop-down menu. Enter 2e-2 into the Velocity in z-direction edit field. Select 7 in the Boundaries list box. Select Outflow/pressure from the Navier-Stokes Equations drop-down menu. Select 1, 8, and 9 in the Boundaries list box. Select Symmetry/slip from the Navier-Stokes Equations drop-down menu. Select Pressure from the Predefined contour plot expressions drop-down menu. By plotting the Velocity field at the mid point one can see that the flow decreases smoothly towards the edges. Select Velocity field from the Evaluation Expression drop-down menu. Enter 0:0.005/100:0.005 into the Evaluation coordinates in r-direction edit field. Enter 0.006 into the Evaluation coordinates in z-direction edit field. Now go back to Equation mode and add the Brinkman Equations physics mode which will account for the porous domains. Select the Brinkman Equations physics mode from the Select Physics drop-down menu. Select 1, 2, and 3 in the Subdomains list box. Enter 2e-7 into the Permeability edit field. Deactivate the Brinkman Equations physics mode in the outer domain. Select 4 in the Subdomains list box. Similarly, deactivate the Navier-Stokes Equations physics mode in the inner porous domains. Switch to the ns tab. The two physics modes are coupled via setting the corresponding velocities equal at the shared boundaries. Select 11, 12, 13, 14, 15, 16, 17, 18, 19, and 20 in the Boundaries list box. Enter u2 into the Velocity in r-direction edit field. Enter w2 into the Velocity in z-direction edit field. Switch to the br tab. Select Inlet/velocity from the Brinkman Equations drop-down menu. Enter u into the Velocity in r-direction edit field. Enter w into the Velocity in z-direction edit field. Select Symmetry/slip from the Brinkman Equations drop-down menu. There now exists two sets of postprocessing variables, one for each physics mode. Plot and compare the magnitude of the Velocity field for both the porous and outer domains. 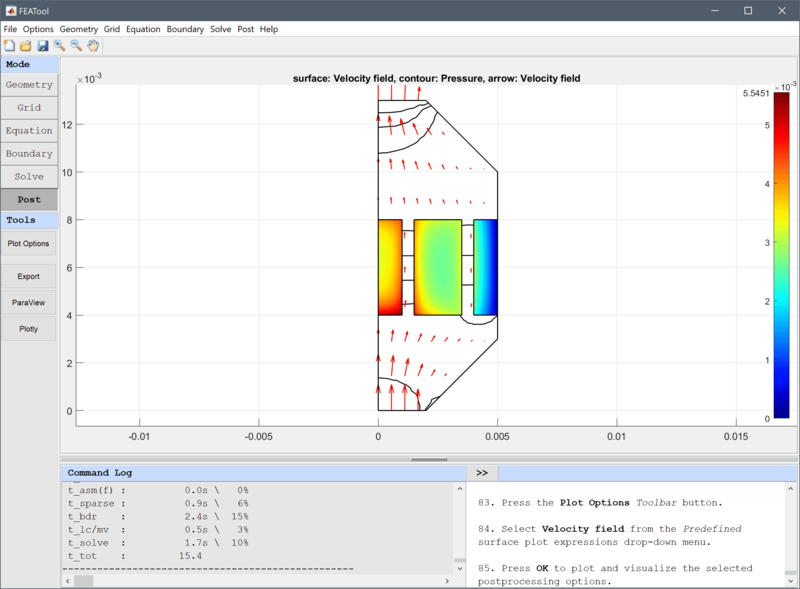 Select Velocity field from the Predefined surface plot expressions drop-down menu. Also again plot magnitude of the Velocity field at the mid point line. As nan values are returned for queries outside the valid domain, one can use the setnan function to plot both curves together. Enter setnan(sqrt(u^2+w^2),0) + setnan(sqrt(u2^2+w2^2),0) into the edit field. Compared to the smooth flow before, the flow now is irregular with two peaks between the porous domains. The flow in porous media multiphysics model has now been completed and can be saved as a binary (.fea) model file, or exported as a programmable MATLAB m-script text file, or GUI script (.fes) file.